Here's our monthly roundup of some of the charitable works and donations by companies in the material handling and logistics space. Salt Lake City-based refrigerated carrier C.R. England and its England Logistics third-party logistics subsidiary provided funding for 1.6 million meals for children in 2018 through partnerships with 21 food banks in the U.S. and Mexico. The companies have set a goal of funding another 1 million meals for children in 2019. Supply chain services company Crowley Logistics teamed up with the United Federation of Teachers' Disaster Relief Fund to deliver much-needed school supplies to students in the U.S. Virgin Islands, which are still recovering from hurricanes Irma and Maria in 2017. Crowley transported 7,000 pounds of school supplies from Florida to the islands free of charge and donated the loading, trucking, documentation, and customs clearance services for the shipment. 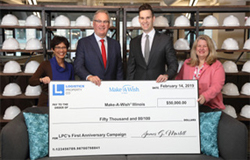 To celebrate the company's first anniversary, Logistics Property Co. (LPC) donated $50,000 to Make-A-Wish Illinois. Although LPC initially set out to raise $10,000 to grant one child's wish, the fund drive ended up netting enough money to grant five children's wishes. Wish Farms, a Plant City, Fla.-based supplier of strawberries, blueberries, blackberries, and raspberries, and produce packaging supplier Monte Package Co. raised $90,000 for a local migrant group at the 6th annual Strawberry Picking Challenge in February. Proceeds from the event benefit the Redlands Christian Migrant Association, a Florida nonprofit that provides childcare and early education for children of migrant farm workers and rural low-income families. In December 2018, Canadian Pacific's Holiday Train completed its 20th journey across North America, collecting 200,000 pounds of food as well as monetary donations. The railway company launched the charitable program in 1999 to celebrate and support the important work of local food banks. Feedback: What did you think of this article? We'd like to hear from you. DC VELOCITY is committed to accuracy and clarity in the delivery of important and useful logistics and supply chain news and information. If you find anything in DC VELOCITY you feel is inaccurate or warrants further explanation, please ?Subject=Feedback - : Logistics gives back">contact Chief Editor David Maloney. All comments are eligible for publication in the letters section of DC VELOCITY magazine. Please include you name and the name of the company or organization your work for.